When the first galaxies started to form a few hundred million years after the Big Bang, the Universe was full of a fog of hydrogen gas. But as more and more brilliant sources — both stars and quasars powered by huge black holes — started to shine they cleared away the mist and made the Universe transparent to ultraviolet light . Astronomers call this the epoch of reionization, but little is known about these first galaxies, and up to now they have just been seen as very faint blobs. But now new observations using the power of ALMA are starting to change this. A team of astronomers led by Roberto Maiolino (Cavendish Laboratory and Kavli Institute for Cosmology, University of Cambridge, United Kingdom) trained ALMA on galaxies that were known to be seen only about 800 million years after the Big Bang . The astronomers were not looking for the light from stars, but instead for the faint glow of ionised carbon  coming from the clouds of gas from which the stars were forming. They wanted to study the interaction between a young generation of stars and the cold clumps that were assembling into these first galaxies. 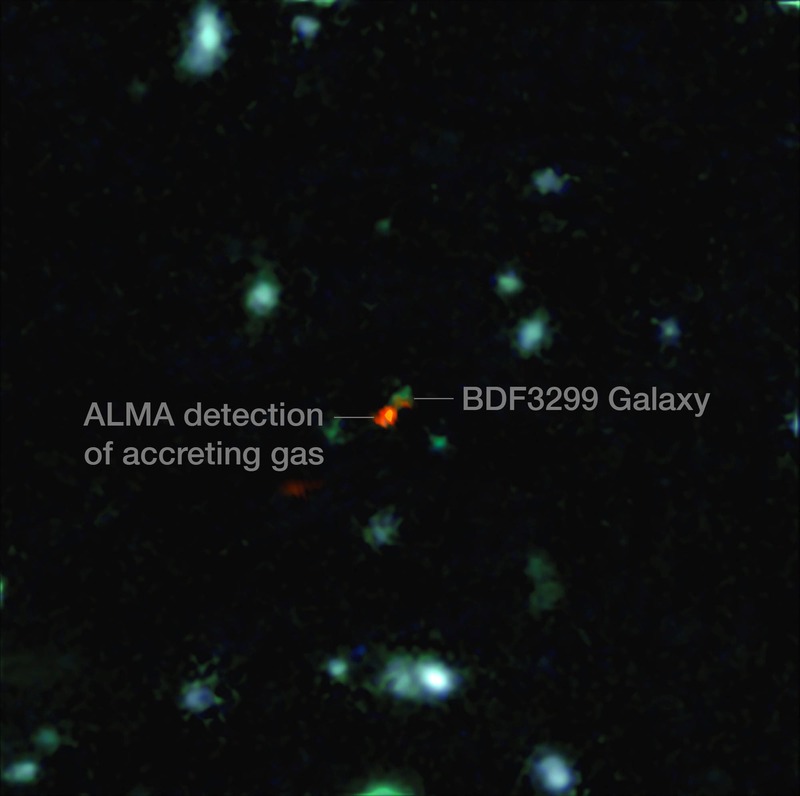 From one of the galaxies — given the label BDF 3299 — ALMA could pick up a faint but clear signal from the glowing carbon. However, this glow wasn't coming from the center of the galaxy, but rather from one side. The astronomers think that the off-centre location of the glow is because the central clouds are being disrupted by the harsh environment created by the newly formed stars — both their intense radiation and the effects of supernova explosions — while the carbon glow is tracing fresh cold gas that is being accreted from the intergalactic medium. By combining the new ALMA observations with computer simulations, it has been possible to understand in detail key processes occurring within the first galaxies. The effects of the radiation from stars, the survival of molecular clouds, the escape of ionising radiation and the complex structure of the interstellar medium can now be calculated and compared with observation. 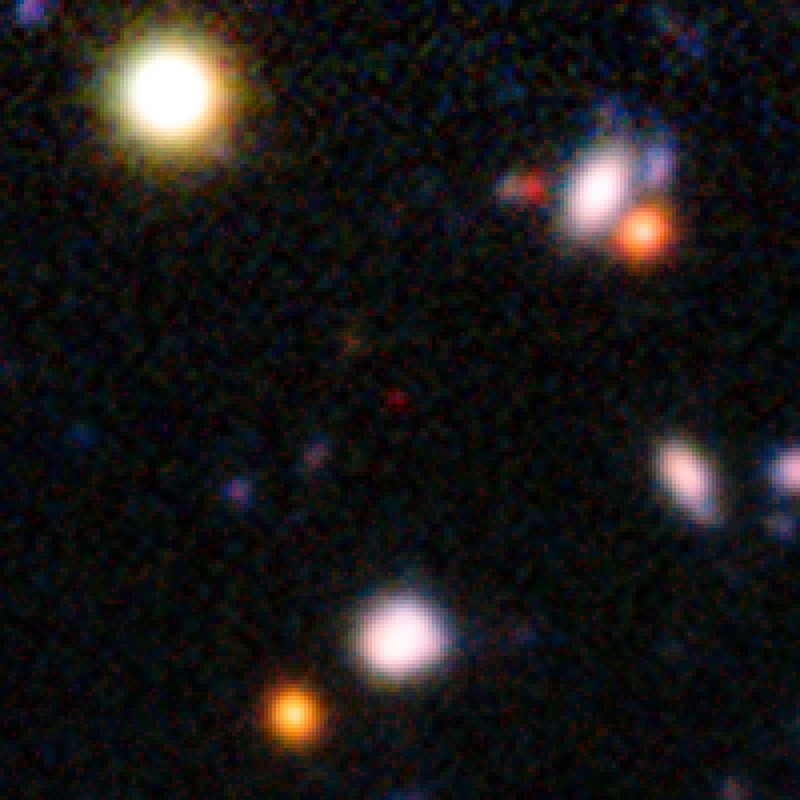 BDF 3299 is likely to be a typical example of the galaxies responsible for reionization. "We have been trying to understand the interstellar medium and the formation of the reionization sources for many years. Finally to be able to test predictions and hypotheses on real data from ALMA is an exciting moment and opens up a new set of questions. This type of observation will clarify many of the thorny problems we have with the formation of the first stars and galaxies in the Universe," adds Andrea Ferrara. The red speck at the center of the very deep image from the ESO Very Large Telescope at the top of the page shows the galaxy NTTDF-474, seen when the Universe was only 820 million years old. It is one of the most distant ever to have had its distance measured accurately, and is one of five that have been used to chart the timeline of the reionisation of the Universe about 13 billion years ago.